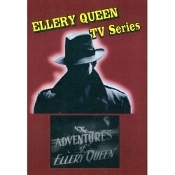 Ellery Queen was a long-running detective series with various actors playing Ellery ov a period spanning twenty years.With the assistance of his father and girlfriend Nikki, Ellery was able to solve crimes that the police could not. His expertise would have made Sherlock Holmes jealous. This collection includes rare, early TV shows (early 1950s) starring Lee Bowman, Richard Hart, George Nader, Lee Philips and Hugh Marlowe. Some of the earliest episodes were telecast "live" on soundstages and a few episodes in this set contain the LIVE BROADCASTS. 2 DVD Set. Quality varies depending of the resources from 7.5 - 8.5.